This short informational video was filmed and produced by a local Australian family to foster greater awareness of Smith-Magenis Syndrome. 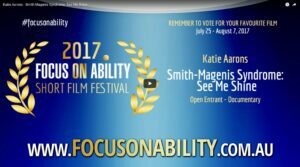 It was submitted into the 2017 Focus On Ability short film festival and through our community sharing and promoting the film on social media, it generated a reach of over 10,000 people! Now that's great awareness!